James D. McCallister has worked as a media archivist, newspaper columnist, free-lance journalist, and small business owner. His fiction publications include two novels, King’s Highway (Red Letter Press, 2007) and Fellow Traveler (Muddy Ford Press, 2012). 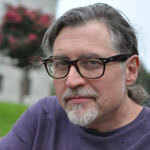 A two-time South Carolina Writer’s Workshop and SC Fiction Project awardee as well as a 2012 Faulkner-Wisdom finalist, McCallister has appeared at the SC Book Festival as a featured author and moderator, and teaches creative writing at Midlands Technical College. A lifelong South Carolinian, he lives with his wife Jenn and their beloved brood of a dozen cats, muses all. In 1997, thirty long years after the Summer of Love, millions mourned the death of music legend Rose Partland, a tireless creative spirit who led her iconic band Jack O’Roses through the rigors of the rock & roll life, until the road finally consumed her—as though a devil had at last come for his due. Of her legions of followers, none seems to suffer the loss of Rose more than Brian ‘Nibbs Niffy’ Godbold, who succumbs to his grief in a fashion similar to that of his idol—too young, too soon. Now, best friend Ashton Tobias Zemp must scour the journals and manuscripts Nibbs left behind, to seek a better answer to the question of his touring partner’s death—was it an accidental overdose, or outright suicide? When he begins to suspect the truth—that Nibbs Niffy went to his grave harboring an appalling and ruinous secret—Ash is forced to reconsider his own past . . . was he a ‘real’ fan like Nibbs, or merely a fellow traveler: a sympathizer, but without the bona fides? 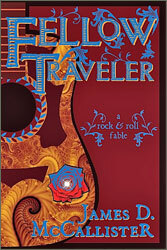 Fellow Traveler made me laugh, cry, reflect and remember—Deadheads and jamband fans who read this book will have an eerie sense of having been part of the story.